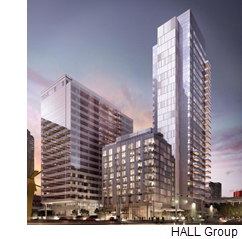 ​ DALLAS – Hall Group's HALL Arts Hotel​, a luxury boutique hotel within downtown’s Arts District, is set to open in the fall. The 183-room hotel will accompany a $250 million, 28-story residential tower, HALL Arts Residences, which is set to open in 2020. The ten-story hotel, which is under construction at Ross Ave. and Leonard St., was designed by HKS Inc.
Two restaurants will be inside the hotel along with 6,000 sf of meeting and event space and a rooftop pool. Virginia-based Latitudes: Lifestyles by Crescent Hotels & Resorts will manage the project. ​Se​e also: Dallas-Fort Worth-Arlington Hotel Market Research.